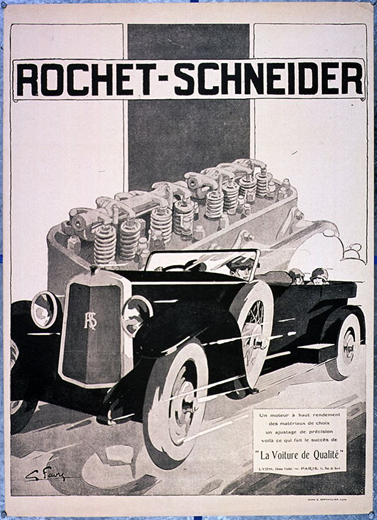 Founded in 1889 in Lyon, by Edouard Rochet and Théodore Schneider, the Rochet-Schneider company was one of the big names at the beginnings of the Lyon car industry. The two associates began by building cycles, but quickly turned to the manufacture of cars fitted with petrol engines. Their top-of-the-range cars were renowned for their quality and performance. During the First World War, to protect against the arrival of the enemy, Louis Renault moved his aircraft engine production to Lyon, to Rochet-Schneider's premises. Between the two wars, production moved towards buses and trucks, as cars were no longer profitable. But persistent disagreements in the company's governance and strategic errors caused it to decline, until it was finally taken over by Berliet in 1960. The old Rochet-Schneider premises were then used to house Berliet's spare parts department. Book : Pierre-Lucien Pouzet, La grande aventure de l’automobile lyonnaise, la Taillanderie, 2006.